I've just received and black one and a grey one. The quality is brilliant. Dri-fit stretchy material. Instantly comfortable to wear and clings to your body without being restrictive. They are quite long too which is a must for the gym. Nothing worse than having to keep pulling a t-shirt down every time you lean forward. As for sizing: I got Large. Most of my day to day t-shirts are Medium but fitted t-shirts sometimes look a bit too tight round my arms and shoulders. The Large size is absolutely spot on. I'm 5ft 8 and quite broad. The t-shirt still looks nicely fitted but has enough room to allow movement and no tightness under the armpits. I'd definitely go for a size bigger than you normally wear. It'll still look fitted but avoids making you look like one of those people who buys small t-shirts on purpose :). 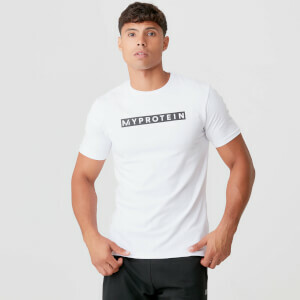 The only downside for me is that aside from the small subtle logo on the front, there's 'Myprotein' printed on the back of the collar. It's no problem in the gym but it will stop me from wearing them for casual. It's a shame because they are so nice to wear that I'd definitely wear them for going out if it didn't have branding on the back. Maybe a suggestion for MP for the future. Very happy with this purchase. I'm 6ft 2 and meadium fits extremely well. 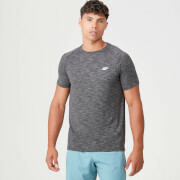 The top washes very well and also is nice and light so I don't get too warm whilst working out. Very happy! This is a great top and is exactly what I was looking for. I ordered a size Small further to the size guide. I am a 38/39'' chest. 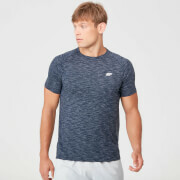 The top fits great around the chest and fits snug on the arms without being too tight or restrictive when working out. The material is stretchy, breathable and lightweight. However, the collar is slightly tight around the neck but gives when working out. The length is good for a size small. I will definitely recommend this top and I will be ordering a couple more further to the current 2 that I already own. Generally a medium in My Protein tops. But this top is a little tight. 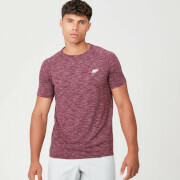 I have similar tops by other brands and Medium always fits well. I would recommend that you buy a next size up. Excellent quality tee shirt, great material, fits perfectly and still in great condition after plenty of washes. So good I have ordered more! Im 6ft and 83kg and a medium fits perfect. A very nice fit and is comfortable with a breathing material that fits me nicely. I've bought a few of these and would highly recommend.